"The wire and the vein"
I based the vector on this scan. The rest of it and the background machine-thingy were just made up on the spot. Brought it to photoshop to color/CG it up. I intentionally went for that 'dirty' look to help convey the atmosphere of this particular scene. This is a spotlessly clean vector work. It is unique in its concept and layout, and there is a very nice harmony in the soft colours. Background has been well-crafted and everything flows together well with perfect shading and CG skills. Well done! Proposed by flyindreams and highlighted by euna. Great idea! I like the concept~ What a cool, metalic looking wallie! ^_^ You did a wonderful job creating this background. Owww nageni-kun you know how much i love your works O_o And your one before this (Eureka7) i just adore ! <3 And this is next one i like. Well done on this beautiful wall. This is very unique, everything seems to be gray and there was glow in couple of places in the face and the machine thingy. extremely well executed, great color palette and emotions. 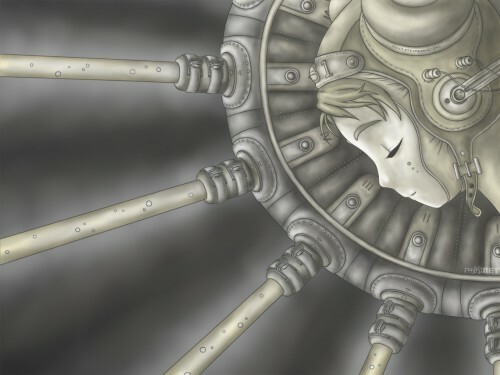 Wow, best wall based on Last Exile, I have ever seen! Great work! I love it , so kawaii..